All the cutting edge tools for small business. In today's competitive online marketplace a small business has to think about more than just a website. They also need to leverage all the emerging markets that are available to them as well. Currently sites like Facebook and Twitter are changing the way people find and communicate with companies they do business with. With the explosion of smart phones and tablets on the market, the luxury of a mobile version of your website has become a necessity. Having all of these outlets include a cohesive brand and message is imperative to your company's success and your personal sanity. 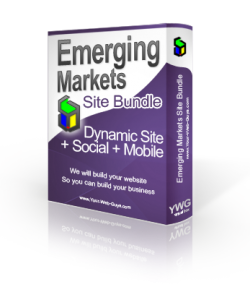 This all inclusive bundle of scripts, design layouts, and custom programming allows your small business to look like a million bucks over all of the current emerging markets. With one easy to use administrative area for you or your employees to work on, this package will allow one click updating over your entire marketing network.